Tag's adventure opened the door for a journey into the underground tunnels and Studio 51. He got to see the on stage production of "House of Yes". He watched the show intently through a hurricane, screams and gun shots. Never did he utter a word. While intrigued by the action on stage he managed himself better than most in the theatre. We applaud Tag for a commendable performance. 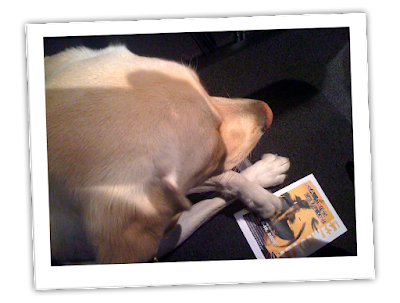 You can see for yourself, he is interested enough in theatre to read the play bill from the next show.